Dumble musical instrument amplifiers are custom manufactured in very limited numbers by Alexander “Howard” Dumble of Los Angeles, California. Dumble began making amplifiers in the late 1960s in Santa Cruz. There are reportedly fewer than 300 in total. Amplifier models have included the Overdrive Special (ODS), Overdrive Reverb, Steel String Singer (SSS), Dumbleland, Phoenix (a rack mounted amp), Hotel Hog and Winterland. Dumble amplifiers are considered to be one of the few precursors to the explosion of Boutique amplifier companies on the market. Musicians who have used Dumble amplifiers include: Carlos Santana, John Mayer, Robben Ford,Larry Carlton, Eric Johnson, Stevie Ray Vaughan, Ben Harper, Lowell George, Steve Lukather, Sonny Landreth, Jackson Browne, David Lindley and Dean Parks. A large number of companies have produced amplifiers somewhat based on the Dumble Overdrive Special. Some DIY amplifier-building hobbyists have also started to build Dumble-influenced amplifiers from unofficial schematics and inside-chassis photographs circulating on the Internet, although many have been voluntarily taken down following requests from Mr. Dumble. Dumble’s Germany importer in the 1980s made a clone called the Kitty Hawk Standard. Since the 1980s, Mr. Dumble has covered the preamp circuitry of his amps with a thick layer of usually opaque epoxy, protecting his schematic’s exact design. Several amplifiers are known to have been “de-gooped” and their component values measured. Some of the companies that produce Dumble type designs have evolved the design, adding features and creating their own sound that in some cases are a departure from the “classic” Dumble tone, functionality, layout and styling. Some companies prefer to faithfully reproduce the Dumble tones and aesthetics as closely as possible, making it available to a much wider range of players than could afford an originals. K&M Analog Designs – A large number of amps that borrow the basis Dumble typography. Amps makers that adapt their products from Dumble designs include Bruno, Fuchs, K&M, and Carol-Ann. Amp makers that attempt to get as close as possible to the original Dumble designs include BludoTone and Ceriatone. Prices for completed Dumble-influenced amps (as opposed to kits) vary from roughly $1,150 for Ceriatone models, built in Malaysia, to more than $8,500 for some K&M models. Compared to other guitar amps, Dumble-influenced designs are generally at the high end of the market. Amps made by Mr. Dumble reportedly sell new for more than $20,000. Given the small output from Dumble, used Dumble amps often sell for more than $30,000. The circuitry varies somewhat between individual amplifiers, as each one was built and voiced for a specific player. Amplifiers built around the same time tend to share some of the same circuitry and component values. However, several amplifiers were later sent back to Dumble to have their circuitry updated. the lead dress, and the use of shielded wire. Dumble amplifiers are built on eyelet boards . The chassis is made of aluminum. All Dumble amplifiers operate using vacuum tubes. Overdrive Specials use 12AX7 tubes in the preamp and 6L6 tubes in the power amp in older models. A few Overdrive Specials, notably #167 and #183, were equipped with EL34 tubes in the power amplifier section. EL34 tubes are associated with a more “British” or “Marshall” sound while 6L6 tubes are associated with a more “American” or “Fender” tone. A separate Dumblelator; buffered effects loop (a cathode-follower output with a triode gain stage for recovery), is recommended for using effects processors with a Dumble amplifier. There are two inputs: a “normal” input and FET input where the signal from the guitar goes to a J-FET line level booster pre-amplifier before entering the first tube stage (originally intended for use with acoustic guitars and other instruments with low output levels). 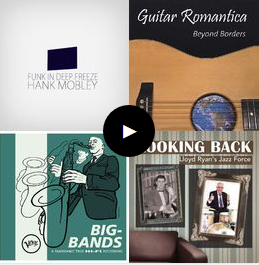 Rock/Jazz (switches between a Fender-esque voicing and a more “hi-fi-type” of voicing). The tonestack is followed by another clean preamplifier stage. The resulting signal is either fed straight into the power amplifier ( clean channel), or into the (two-stage) overdrive section. The power amplifier uses a standard long-tail pair phase inverter with negative feedback. It will break up , but only at very high volume levels, or when the preamplifier “boost” switch is engaged. In some newer models (1990s to present), the overdrive stages are followed by a passive tonestack (treble , middle and bass), which is adjustable using trimmer potentiometers inside the amplifier. This is known as the “Hot Rubber Monkey” (HRM) modification (these amplifiers are voiced for the overdrive channel to be used with the preamplifier boost engaged). Most players use three tones: clean, clean with boost on, and overdrive with boost on. The “Skyliner” EQ refers to a newer (mid-1980s to present) way of voicing the tonestack. It is said to provide a better clean tone than the earlier voicing of the tonestack. Some lower serial number amps have been retrofitted with this EQ. The so called “Robben Ford Mod” (terminology used by DIY-hobbyists) refers to using a power resistor instead of a choke in the power supply in order to induce more “sag” in the amplifier. This amp was built for Ry Cooder and is a 50 watt overdrive special with added tremolo. Much of the circuitry in the Overdrive Reverb is similar to that of the Overdrive Special. The reverb circuit in one known specimen uses three tubes ( two tube configurations are commonly used). The first tube is used to amplify the input signal, which is then sent to the second tube that drives the reverb tank through a transformer in a configuration similar to that used in Fender amplifiers. The third tube mixes the clean and the reverberated signals . Both reverb “send” (the signal level sent to the reverb tank) and reverb “return” (how much of the signal returned from the reverb tank is mixed with the dry signal) are individually controllable. This model was made in very limited numbers. Power output was usually 100W, although Stevie Ray Vaughan’s famous “King Tone Consoul” SSS was rated at 150W. It was a “clean”, loud amp with no overdrive section. The standard model used 4 x 7025 high-mu twin triodes; 1 x 5751 high-mu twin triode and 4 x 6L6 power tubes. 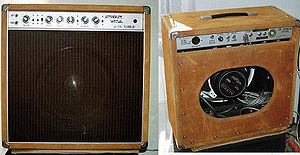 The amp used a standard Dumble tonestack with an optional two tone switch tone filter. 300 W DUMBLELAND 300SL (six 6550A beam power pentode output tubes).Power tubes were drive by a 12 BH7 (one in special , two in 300 SL) as a direct coupled cathode follower. Instrument inputs include FET input as found in ODS. Front panel controls include two rotary switch controls labeled as tone expander (special) or tonefilter(300 SL) and controls for reverb in 300 SL model (send and return). Tonecontrols/switches are standard Dumble style. One amplifier intended/ordered as a “blues” amplifier ( derivative of the standard model) uses two EF 86 pentodes (the first configured as a triode), rather than the single 7025/12 AX 7, in the pre-amplifier section. The Winterland was designed primarily as a bass amplifier. It is rated at 450W at 8 ohms. It was named after the San Francisco concert hall. Dumble also occasionally makes a tube-buffered external effects loop called a Dumbleator. A few Dumble amps have a Dumbleator circuit built into them, but most do not. Many users insist that a Dumbleator is required to obtain the optimal sound when using effects boxes and pedals. The Dumbleator has separate “Send” and “Receive” circuit for the effects; a gain control, “Bright Switch” and a return level. Dumbleators are even rarer than Dumble amplifiers. The original Dumbleator was mono-in with mono-out, and follow-up Dumbleator II allowed for stereo output instead.